A nice breakfast (or anytime) treat. If you have been following Baked Perfection for a while, you know that I feature scones recipes from time to time. You probably also noticed they are all a variation from the same recipe shared with me by my mother-in-law. 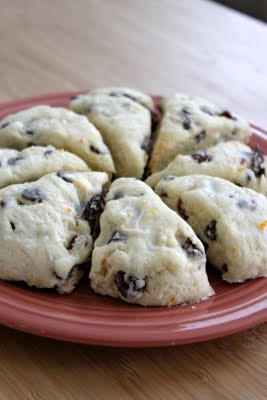 To this day, this recipe is still the only scone recipe I like. They are soft, moist, and oh so delicious. Some people are shocked to find that they don't have any butter in them. I am pretty sure my friend Ellen did not believe me, but she still loved them. I have been wanting to make a cherry chocolate scone for a while, and I finally got around to it and was not disappointed one bit. I used the zest of a clementine (because that was the citrus I had on hand) in the dough and in the glaze and it added a nice brightness to the scones. I will definitely try these again...and you should definitely give them a try. 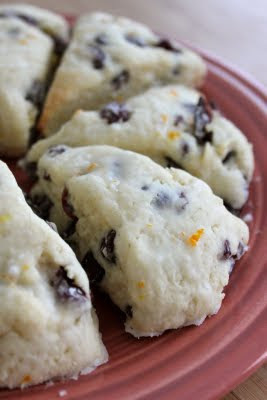 Mix flour, sugar, baking powder, orange zest, salt, dried cherries, and chocolate chips. Pour in heavy cream. Mix or knead by hand, just until combined. Mixture will be sticky. Flour surface. Divide dough into two sections and pat into two rounds, each approximately four inches. Using a pizza cutter, cut each round into 8 pieces and place on a greased large cookie sheet. Bake 9 to 11 minutes. Let cool five minutes, then glaze. P.S Happy Father's day Dad. I love you! Thanks for reading my blog and bragging about it to everybody you know! Now that is what I call Pizza!